Do you think the zombies heard us? Have you ever asked yourself the question, “How long would I survive in a zombie apocalypse”? Have you ever wondered what would happen if the dead started rising? Do you have a zombie survival plan in place? 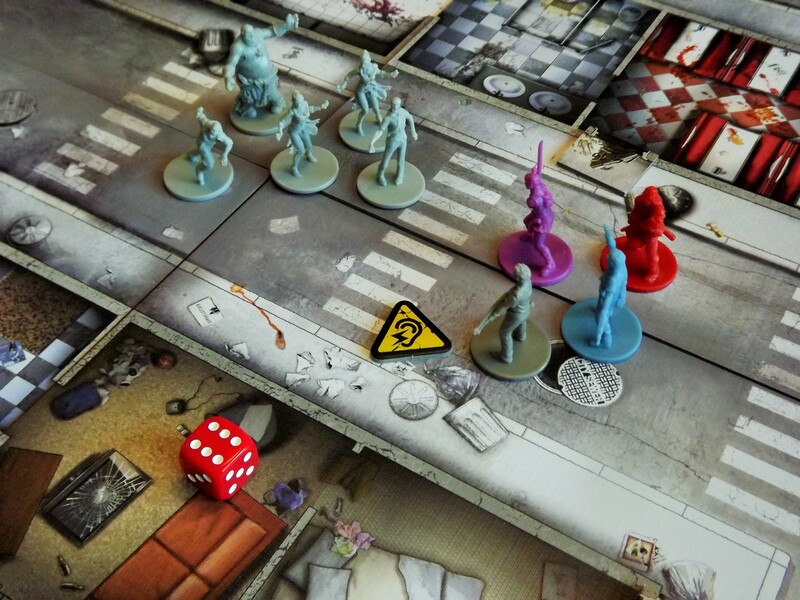 If you answered “yes” to any of these questions, you are ready for Zombicide! 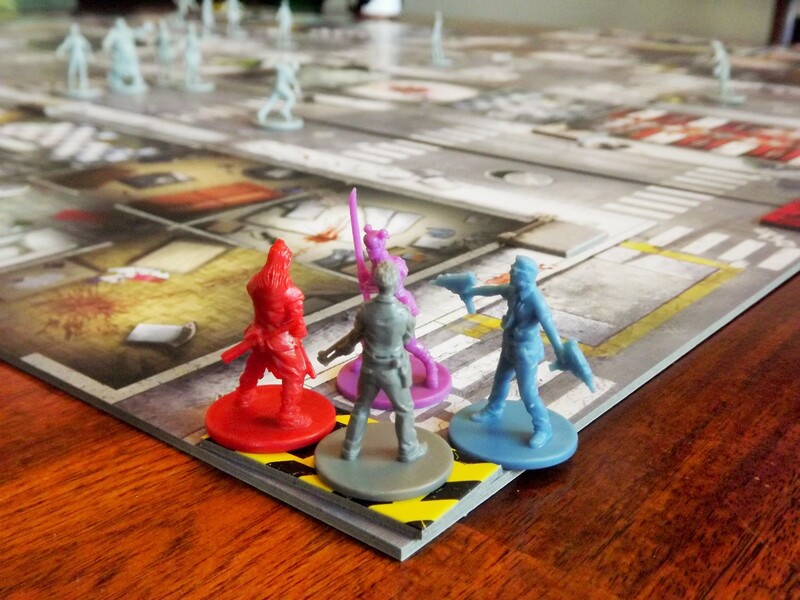 A game where you fight to survive against the oncoming zombie horde! 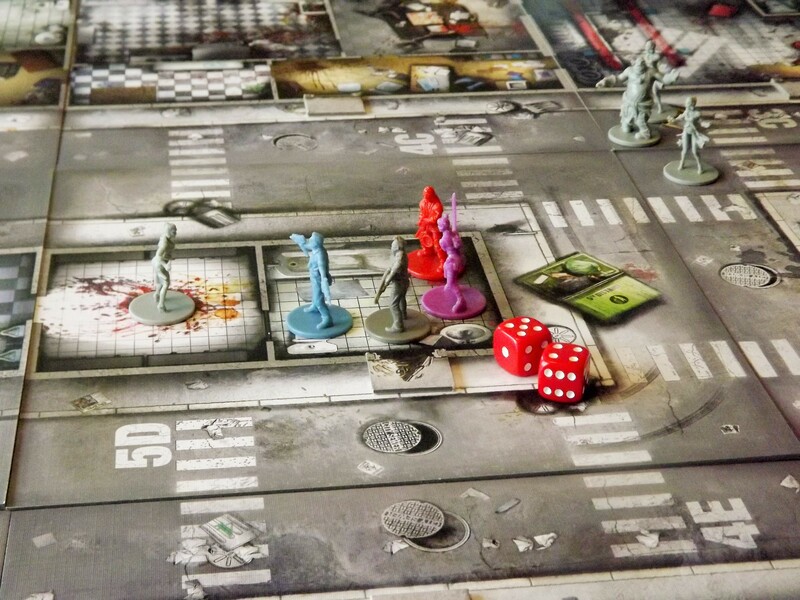 Zombicide is a co-operative game played solo or with up to 6 players. 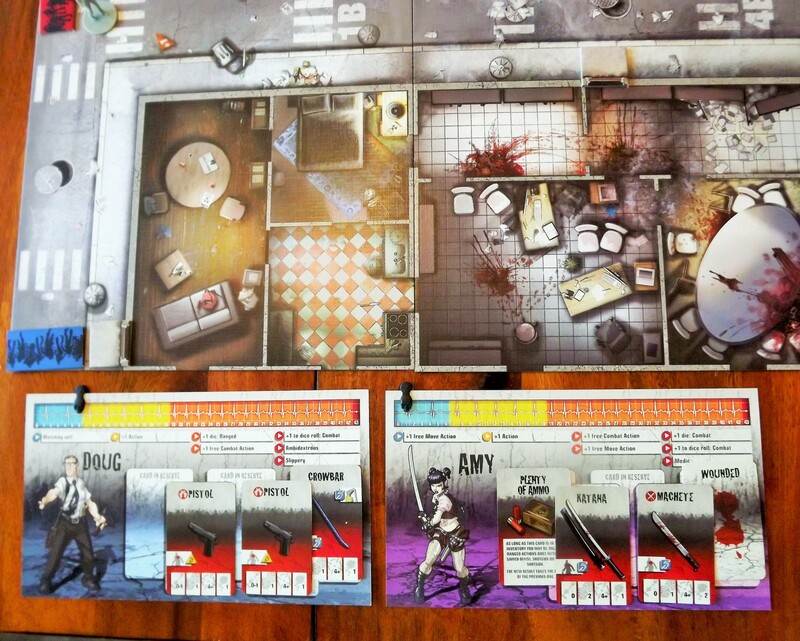 The rule book has missions you set up with the modular boards and the object is to survive while completing the mission objectives. Initial set up for one of the missions. Each character has an initial 3 actions they can do in the player’s phase of the game. These actions involve moving, searching, opening doors, reorganizing your inventory, combat, using a car, getting an objective, activating objects, and finally making noise to draw zombies towards you. The survivors also begin with special skills that add an additional action at no cost to the player. Combat is dictated by the weapon cards your survivor possesses. They are either melee or ranged, and either noisy or silent. How you use the weapons is listed on the cards. They show you the range, the number of dice you roll, the accuracy (the value on the dice that will be successful), and how much damage is done. With a melee weapon, you can choose the targets you wish to attack on your space. Ranged weapons assign hits in a certain order. Survivors are targeted first, followed by walkers, then fatties and abominations, and finally runners. Fatties and abominations can absorb hits, so even if your roll is successful, it may not hit a runner. Once the survivors have completed their actions, the zombies’ phase begins. Zombies either attack survivors in their space or move to the nearest survivors (or where there is the most noise if no survivors are in their line of sight), with the exception of Runners which can move and attack. 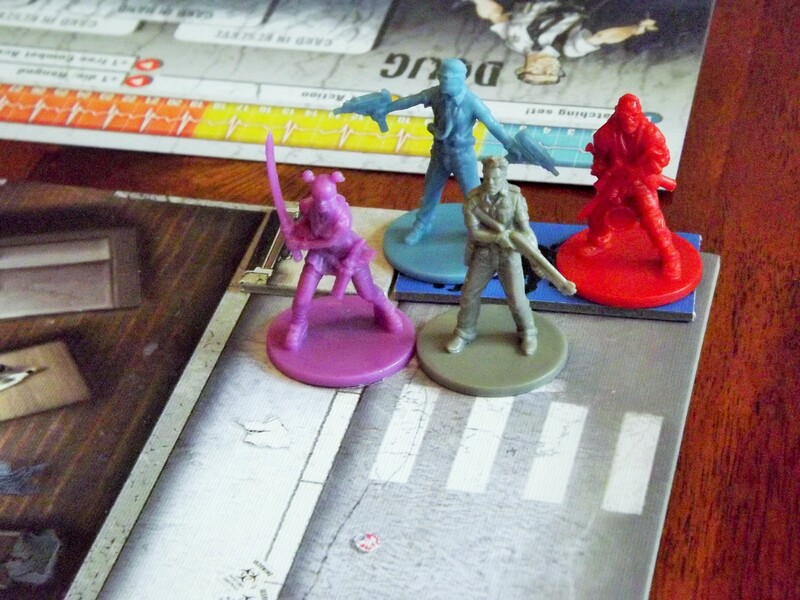 Then, zombies spawn on the board. When the zombies have finished their spawn phase, the end phase begins. Noise tokens are removed from the board and the first player token is moved to the next player (clockwise). The game ends in a loss when all survivors are eliminated, or in victory when all the mission objectives have been completed. Lose your Head or Dead Man Walking? 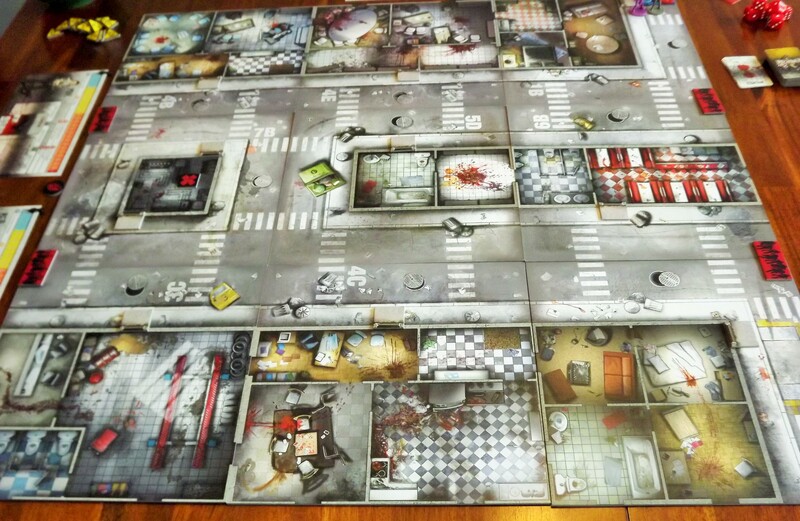 Zombicide is a game dripping with theme. It feels as though you’re trying to survive the zombie apocalypse and the outlook is grim. You feel hopeless, trapped, and helpless. It is a true zombie experience. Your heart races as more and more zombies fill the board. Sweating, you watch as they shamble towards your small team of survivors. Our Heroes are ready for battle! The game requires true strategy and co-operation to win. You and your fellow survivors must work together to achieve the objectives. If you don’t, you have no hope of surviving. 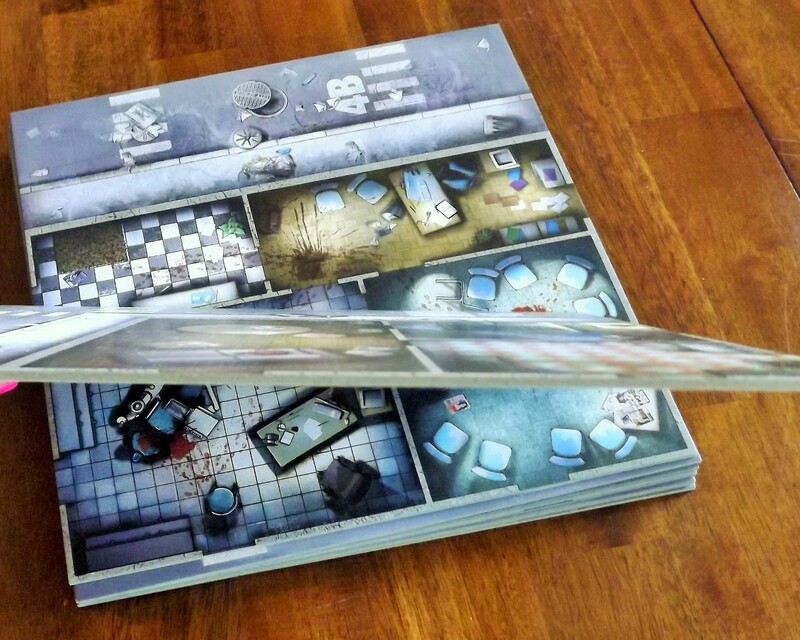 It also has great replay value as each scenario can be played differently depending on the players, the decisions that are made and the outcome of the combat. There is a luck based element to the game as you use dice to resolve your combat. The better the weapon you have, the more dice you roll and so, the greater your chance of success. When you begin the game, you randomly draw your starting weapon cards. If you get stuck with frying pans, your best bet is to search a building. This triggers a zombie spawn, so make sure someone with a good weapon can back you up – there is very little chance of success with a pan in your hand! The game’s difficulty increases as you play. Since the spawns are linked to the player’s level, the more zombies you defeat, the more zombies will spawn. If you have a player who loves killing zombies, this could lead to conflict with someone who wishes to keep their experience level low to avoid the more difficult zombies. Will our survivors make it to the end?! The rule book is a bit difficult to follow and vague at some points, and it took watching a video tutorial to really grasp the rules. It seemed to me that it could have been streamlined and much more clear. Perhaps a good editor would have helped the game creators simplify its wording. I am not the only one who had issues, which means there is a lot of information online and FAQs to help you along. However, once you understand the rules, the game is pretty straightforward and easy to teach. The long initial set up may be daunting to some casual gamers, but the game itself is not as complex as it first seems. The most confusing element is the targeting rule, which seems somewhat illogical, but I can see what the game designers are trying to do. The rule causes you to target your friend before any zombies. This gives you a sense that if the survivor and a zombie are on the same space that they aren’t just standing idly. Instead, they are actually struggling with one another. Your friend is trying to stop the zombie from eating them! This is supposed to give you a feeling that they are actually fighting for their life! So the chances in a “real life” situation of hitting the other survivor are just as high as hitting the zombie. I doubt this would happen every time so I’d rather see a 50/50 chance of hitting the survivor as you do the zombie. It would be more realistic. But, the rule does work, despite being exceedingly frustrating. The role noise plays in the game is an interesting mechanism. If a zombie doesn’t have line of sight on any survivors, then they follow noise. Every survivor is a noise maker. If a team of survivors split up, the zombies will head in the direction of the loudest party. You can use one of your actions to make more noise, or use a noise making weapon to lure them to where you want them to go. This is pretty realistic; well, as realistic as a zombie game can be! The weapons and how they create noise makes sense. A fire axe will make a lot of noise crashing into a solid door, but none when decapitating a zombie. A chainsaw will make noise regardless! Unless you have a full complement of players, each person may have to control multiple characters. Unfortunately, this can detract from the connection you have with your character. Rather than being immersed in the story and playing your part, you feel omnipotent, which lessens the experience of the game. Playing two characters at once. I suggest doing the tutorial mission to begin learning the rules of the game. It’ll help you get a feel for the game and set up without being overwhelmed. It only involves a couple of zombie spawn cards and two of the game tiles. It takes about a half an hour and leaves you confident when you finish; almost too confident. We played another mission right away and it did not go well. 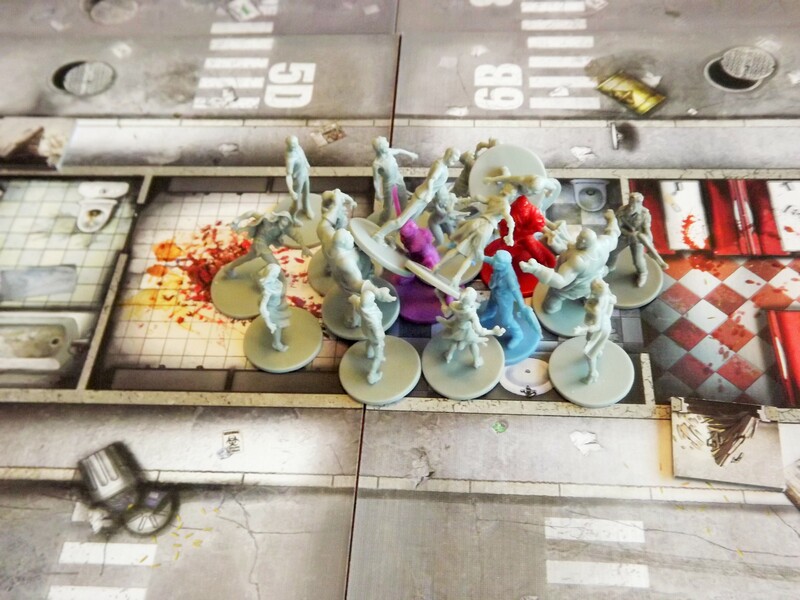 It involved stopping zombies from leaving the game boards and getting rid of the spawn zones, and we found that we could not effectively stop the tide of zombies from escaping! We were overrun by zombies within 15 minutes with no survivors. We were really forced to rethink our strategies. The missions have rankings of easy, medium and hard. These can be a bit misleading. The mission we failed was supposed to be easy and it wasn’t, while a mission of medium difficulty proved to be easier because we could plan our strategy. Beware, the missions listed in the rule book are not in order by rank; the easy mission is actually listed seventh! Will our survivors suffer a crushing defeat?!? The game itself looks fantastic and tells great stories. The minis are wonderfully done. They are more rigid than some other plastic figures I’ve played with, and they feel like they’d survive an apocalypse! Also, if you want to paint them, they are ready to be primed. The plastic inserts in the box are pretty flimsy, but they do keep the minis from shifting all over the place. The modular game board tiles are sturdy, so I never worry about them bending, even with multiple plays. The artwork on them is fantastic making you feel as though you are in the streets of a city. The tiles are divided into zones via “zebra stripe” cross walks. I like this way of defining the spaces as it keeps with the game theme. It would be nice to have the actual objectives look like what your mission involves instead of a generic “x” tile. I understand that they need to make them versatile, but the rest of the game looks so great, it is a bit disappointing. 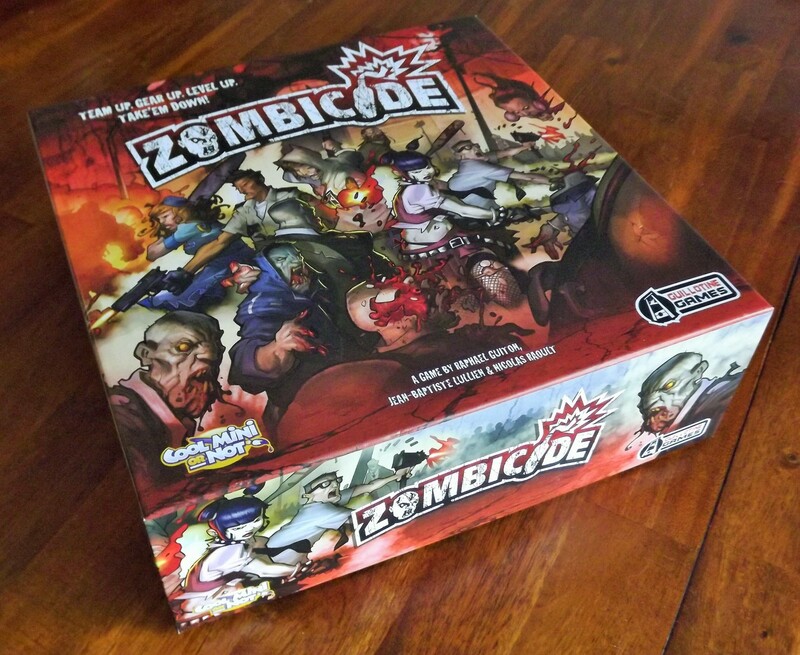 The game box has great artwork, although a bit on the gory side. But hey, it’s a zombie game so what do you expect? If you are sensitive to that level of gore or have small children, it might not be the best game to buy. Nice, sturdy tiles, will survive the apocalypse! I enjoyed the realism of this game and any fan of the genre will too. The theme is really its defining feature. You get swept away in the story of survival, so the simplistic game play actually feels like a rush to the finish line. Turns are quick because they have to be! There are plenty of zombie games out there, but this one involves all the players, all of the time which anybody who likes co-operative games will appreciate. You need to have your wits about you to make it through to the end, but a random roll of the dice can make it that much harder. Every rule feels like it belongs in a zombie survival movie and was inspired by them. You can tell the game makers really wanted the experience to feel authentic, and they made a game that you’ll talk about even after it’s over. Thanks for including ‘Art is graphic’ as a con – I’ve not seen this mentioned anywhere but it’s a huge turnoff for me. The game seems to have a real “We got a video game and made it work in a board game” look to me, which I’m not so keen on either.